We were delighted to locate this very interesting stone pillar about a mile from Ballyvourney Church. The stone is carved with an encircled cross of arcs on each face, and with a curious walking figure on the east face that appears to be a pilgrim. 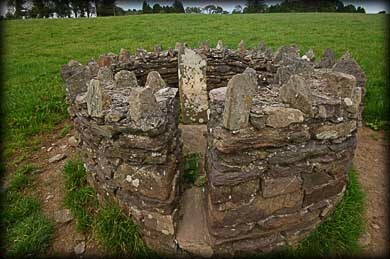 Found near its present location, it has been enclosed by a circular wall, probably to protect it from livestock. The cross of arcs is a symbol likely associated with pilgrimage, although not necessarily the only one. It is one of several in a wide arc that spans from Cork and Kerry, to the Aran Islands, then continues up the west coast of Ireland to Croagh Patrick in Mayo, Inishtrahull in Donegal and on to Drumnacur in Antrim, as well as crossing the Irish Sea to Iona in Scotland and the Shetland Islands. 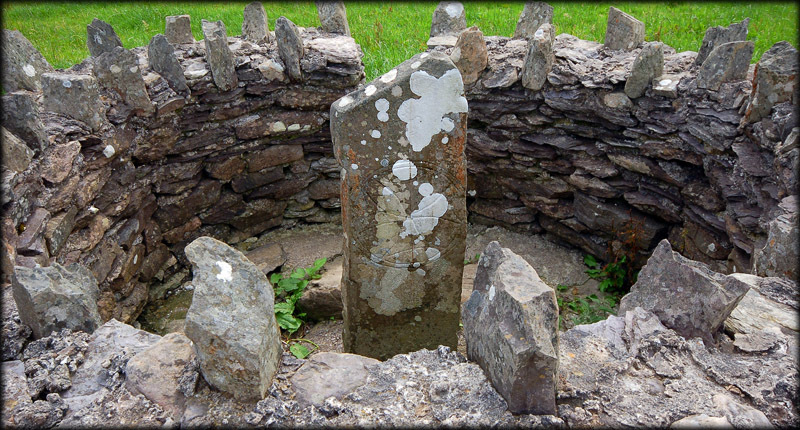 Another stone that has both a pilgrim figure and cross of arcs is the Marigold stone in Carndonagh. Stones with just a pilgrim figure include Killadeas and the White Island figures in Fermanagh, and a carved figure at Carndonagh. 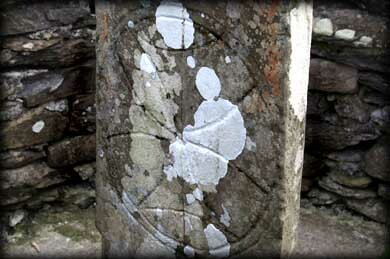 The cross of arcs also appears on a number of sundials, such as Monasterboice in Meath, and Kilmakedar in Kerry. Situated: From Ballyvourney head SE to Ballymakerra, upon leaving the village take the first left, this turns back towards the west. Drive along here keeping a close eye on the fields to the right. You can see the walled enclosure from the road. 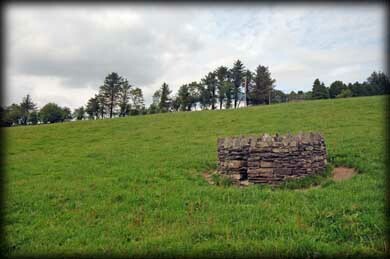 A hidden gate leads into the field. Discovery Map 79: W 2135 7708. Last visit July 2011.